Alejandro Rei’s life was one of middle-class comforts in a leafy suburb of Buenos Aires. There were cookouts, rugby games, a job running a gas station and what seemed like a normal family life shared with his doting parents, Victor Rei and Alicia Arteach. The truth, though, came barreling through the door, thanks to a group of determined grandmothers in Argentina. They have searched for the babies their children delivered while held as political prisoners of the country’s 1970s-era military dictatorship. In the depravity that marked the period, the young mothers were killed after giving birth and the babies were handed over to military families to raise. The man Alejandro believed to be his biological father, Victor Rei, had been a cog in the ferocious military machine that ran Argentina back then, an intelligence officer whose job had been to root out subversives in Argentine society. DNA evidence would reveal that Alejandro’s birth mother was a blond-haired, oval-eyed beauty named Liliana Fontana. In recent years, investigators probing war crimes committed by the 1976-1983 military dictatorship determined that Fontana and her partner, Pedro Sandoval, had been detained, tortured and then killed, though their bodies have never been found. Investigators believed that Fontana had left behind the baby she had been carrying when she was first arrested in mid-1977. That baby was given to Victor Rei and his wife during a night-time rendezvous in early 1978. They named the boy Alejandro. “For me, it’s impossible to imagine something more evil than this. In March 2004, the man Alejandro thought was his father became the target of a government investigation. The son said he tried to shut out the past. He also vowed to help defend the parents he had always known. His father told him that they had taken him into their care to save him from certain death. He told Alejandro that the military had orders to kill the babies of those who had been imprisoned. At the same time, an organization called the Grandmothers of the Plaza de Mayo, a human rights group made up of women who had lost their adult children to the dictatorship, was prodding judicial authorities to determine who had been Alejandro’s real mother. The group, formed in the midst of the military junta, gets anonymous tips about young people believed to be the children of those who vanished while in military detention. They then use investigators and court orders to ferret out the truth. In Alejandro’s case, they had collected his birth certificate and saw that it had been signed by a doctor who had frequently put his name on false birth certificates, helping several military families adopt babies taken from doomed mothers. 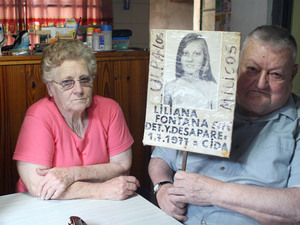 Alejandro Rei’s biological grandfather, Ruben, holds a photo of his daughter, Liliana. Operatives of Argentina’s military dictatorship kidnapped her in July 1977 and she gave birth to Alejandro while in custody. By May 2004, authorities had enough evidence to charge Victor Rei with kidnapping and falsifying documents. He was locked up in Campo de Mayo, which coincidentally had been the military base where investigators believe Fontana had probably given birth. In 2006, using a court order, the police raided Alejandro’s apartment and came away with his comb, toothbrush and other personal belongings. On July 14 of that year, they announced that the DNA gleaned from those belongings showed that he was the biological son of Fontana and Sandoval. Weeks later, in a judge’s courtroom, Rei met his grandparents and other relatives. But recalling the saga, he said that he felt guilt — guilt that Victor Rei and Alicia Arteach were facing jail time — and annoyance that his life had been turned upside down. “I began to carry a weight called guilt, and I blamed myself for all this,” said Alejandro, now 32. For the Grandmothers of the Plaza de Mayo, and others working to uncover the crimes of the past, the case has been important. More than 500 babies were stolen during the dictatorship and 400 remain unaccounted for. Alan Iud, a lawyer for the Grandmothers group, says the Rei case is one of many that shows that the theft of babies was systematic. “For me, it’s impossible to imagine something more evil than this,” Iud said. In recent years, because of the Grandmothers group, 100 babies — now adults in their early 30s — have been found. The search continues, and the Grandmothers group has help, among them President Cristina Fernandez de Kirchner, whose government has thrown its support behind the effort to uncover the crimes of the past. The Grandmothers organization also has a powerful tool: a new law that speeds up the identification process by forcing young adults thought to be the children of the disappeared to provide DNA samples. Driving the effort is an urgent reality: the grandmothers are dying off. Among those searching for her grandchildren is Elsa Sanchez de Oesterhelt, who is 85. Her four young daughters — all members of the guerrilla group Montoneros — were killed. Two of them, it is now believed, gave birth during their detention. In her Buenos Aires apartment, Sanchez de Oesterhelt has scrapbooks and photographs of her daughters, as well as of her husband, who was also detained by the military and never seen again. Their loss, she said, has left her emotionally mutilated. What’s kept her going, she said, is the hope that she’ll be reunited with her missing grandchildren. But she also said time is running out. “It’s like a lottery and I don’t know if I’m going to live to see the day that they find them, if they find them,” she said. In Buenos Aires, archaeology students are excavating under a highway, to restore what was once the Athletic Club torture center. Gaston Durou, one of the students, said the idea is to ensure that Argentines do not forget their past. The words “Help Me Lord” are scrawled on a wall that the students have recovered; 1,500 political prisoners passed through the Athletic Club. Delia Barrera is among the few survivors, and has clear memories of Fontana and Sandoval. She remembers how they sang to each other, and how the guards made them clean the bathrooms. She also remembers the day Fontana hugged her goodbye, when Barrera was released. “She gave me a kiss, and I could feel her pregnancy,” Barrera said. Fontana had no idea what her captors had in store for her. By 1978, she was dead — and her baby was in the hands of Victor Rei. Fontana’s mother, of course, never knew for sure what happened to her daughter. But Clelia Deharbe de Fontana says she was always certain the baby had survived. She would never learn the full story from Victor Rei. At his trial last year, the former intelligence officer declined to discuss his role in the war against suspected subversives. But with Alejandro’s identity firmly established, the elder Rei had little chance of mounting a strong defense. The court convicted him and sentenced him to 16 years in prison. For Alejandro, the trial was emotionally difficult. He could not help but recount, in front of the court, that Victor Rei and his wife had been good parents. But he also came to the realization that everything they had told him about his past — and how he had wound up in their care — had been a lie. He also began to fully understand Victor’s role in Argentina’s junta. Alejandro says that he has tried to make up for his lost life by building a strong bond with his grandparents. When he arrives at their home, on the outskirts of Buenos Aires, Deharbe de Fontana showers him with hugs and kisses. She said that she cannot get over how much he looks like her daughter, especially the big oval eyes. “My daughter would be happy,” she said. Alejandro has also worked to regain the identity he said he should have had all his life. He took the initiative to get another DNA test done, and once more, the authorities said he was the son of Liliana Fontana. He is now working to legally change his name.